The Brighton Ski Resort in Utah offers some of the best skiing in America with numerous lifts, a variety of terrain and lots and lots of snow. You can visit the resort each year between mid-November and mid-April for a fun-filled family vacation that's sure to create memories that will last a lifetime. Where Is the Brighton Ski Resort in Utah? The Brighton Ski Resort in Utah is just 35 minutes outside of Salt Lake City, making it one of the most accessible ski resorts around. If you're heading to the mountain immediately after flying into the airport, simply catch IH-215 South to Exit 6 to the right. This becomes Wasatch Drive. When you see Big Cottonwood Canyon, turn left and follow it to Brighton. It couldn't be easier! The resort operates from 9:00 am to 4:00 pm, seven days a week and also offers night skiing Tuesday through Saturday from 4:00 to 9:00 pm. You can expect roughly 500 inches of fluffy, dry snow each year. The beginner and intermediate trails are all groomed nightly, while the advanced trails are generally left natural. 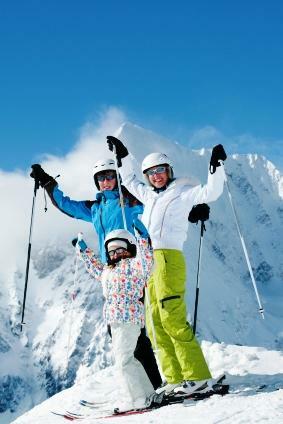 All the terrain is accessible by high-speed quad lifts with a wide variety of beginner, intermediate and advanced runs. The resort offers four terrain parks. Night skiing includes 22 lighted runs and 200 acres of terrain - the largest night skiing area in Utah. There's a 1,745 foot vertical drop from the lift-serviced runs to the bottom of the resort. There's a total of 1,050 skiable acres, 66 groomed runs and even more off piste runs. You can use the Brighton trip planner to book your vacation package, considering factors like lodging, lift tickets and ski school classes. Make sure you check their site for special discounts and compare vacation package deals to make sure you're getting the best deal you can.